Students share WordPress news from WordPress development, contributions, WordCamps, WordPress events, and tutorials and tips they find throughout the quarter. On October 22, 2015 Scott Taylor, who is leading the WordPress 4.4 development cycle, announced the release of WordPress 4.4 Beta 1. It offers a wide variety of improvements and enhancements, and developers are excited to test drive the new version. REST API (phase 1) — The underlying infrastructure of the WordPress REST API plugin is included in WordPress 4.4. Plugin authors can take advantage of this by adding custom endpoints. Term Metadata — Taxonomy term metadata is included in WordPress 4.4. Developers who are using a plugin to implement term metadata should read this post on how to prepare for the switch. Also, the underlying WP_Term class improves caching when working with terms. Improved <title> output — wp_title() is deprecated; WordPress will handle the rendering of the document title automatically. In an article on the WP Tavern website, Jeff Chandler details whats under the hood, which may explain all the excitement. Twenty Sixteen – Twenty Sixteen is a new default theme with a simple layout and color scheme designed by Takashi Irie, who also designed the Twenty Fourteen and Twenty Fifteen default themes. Responsive Images – WordPress will automatically deliver a more appropriate image to users depending on a variety of conditions like screen size, view port size, and screen resolution. oEmbed Posts – In addition to YouTube, WordCamp.TV and other whitelisted providers, users will be able to easily embed content from almost any site that supports the oEmbed standard, including WordPress sites. According to Sarah Gooding’s post, Twitter has “open sourced Twemoji,” meaning the emoji characters/symbols we all know and love to use on our phones are now accessible on twitter and can be seen all alike on mobile devices and desktops. In even more interesting news, Twitter also partnered up with Automattic to help WordPress do the same. Sarah also briefly explains how it may be easy to use emoji’s on a mobile device, but could prove slightly more challenging to desktop users. So to help she shared a small cheat sheet to use emoji on desktop. She also says, “Mac users type Command + Control + Space while in a text editor. Windows… users can make use of the touch keyboard, which includes emoji support” (Sarah Gooding). This is a great step for emoji users and it eraser a very annoying problem that’s been around for quite some time. Net Neutrality is important for small business owners, startups and entrepreneurs . Net Neutrality preserves our right to an open internet. An open internet allows these entrepreneurs to communicate freely on the web. In May 2014, FCC Chairman Tom Wheeler released a plan that would give internet service companies control over free speech on the web. This meant that they could block and discriminate against any applications or content that was carried on these networks. Internet service providers could charge websites and companies money in order to have their packets delivered faster. Advertisers with more money would get a higher speed and a student blogger might be slowed down. 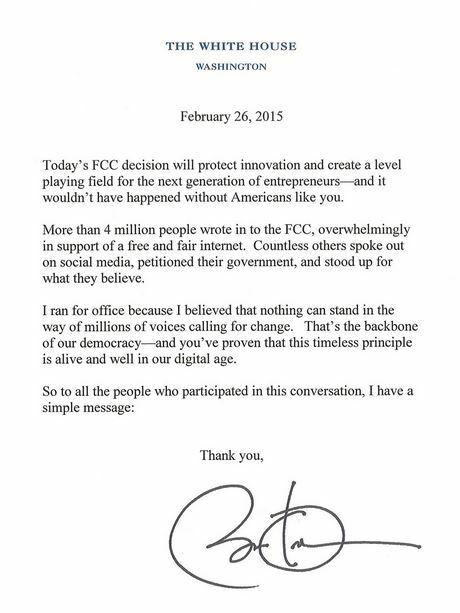 A letter from the President expressing his support for Net Neutrality. An internet protest was held by Etsy, WordPress, and Netflix to draw attention to the idea. Wheeler’s original proposal was shot down and revised after activists fought back. He based the new proposal of the Net Neutrality rules on Title II of the Communications Act, giving Internet users the strongest protections possible. The FCC approved Wheeler’s proposal on Feb. 26, 2015. The rules rooted in Title II of the Communications Act ban throttling, blocking and paid prioritization. Sergej Müller, Creator of Antispam Bee, Says Goodbye to WordPress. Learn more at WP Tavern. WordCamp US 2015 Now Accepting Applications for Host City. Learn more at WP Tavern.